Yes, I am still cooking… I’ve just got some catching up to do here, that’s all. So I’ll get things started with another dessert, made last week (or was it the week before?). You see, I decided to give apricots a shot this year. I love nectarines, but I’m not a fan of peaches, so when I brought home a bag of fuzzy little apricots from the farmer’s market, my method of choice for consumption was baking. I find that I’m more inclined to try new things if they are hidden in an otherwise familiar baked good, although ice cream is emerging as another front runner in the enabling department. 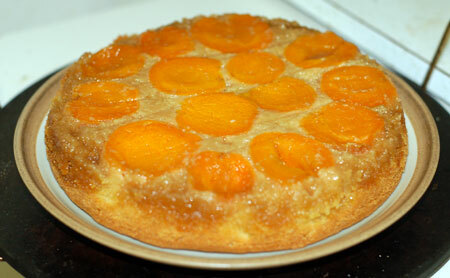 So I started looking through apricot cake recipes, and settled on the apricot-almond upside down cake found here, in the San Francisco Chronicle. 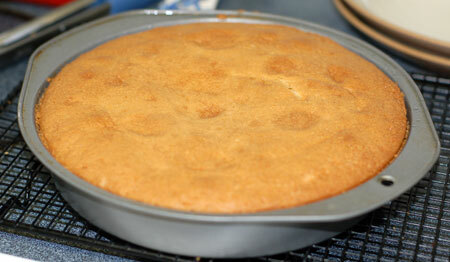 I like almond cake, and it sounded beautiful and promising. The cake did indeed turn out beautifully. Thanks to the parchment paper insert, I had absolutely no issues with sticking, and learned that an ordinary dinner plate will fit in the opening of my new springform cake cover (there’s a big hole in the bottom where the glass bottom of the springform is meant to fit). The cake was tasty and almondy, and the apricots… were sour and vaguely unpleasant. I didn’t like them at all, and Jeremy ate more of the cake than I did, though I noticed that after a few days, he was picking apricots off the cake as well. I’m willing to concede that perhaps my apricots weren’t ripe enough—although they were quite soft—so maybe I’ll give it a year and make some apricot ice cream instead. 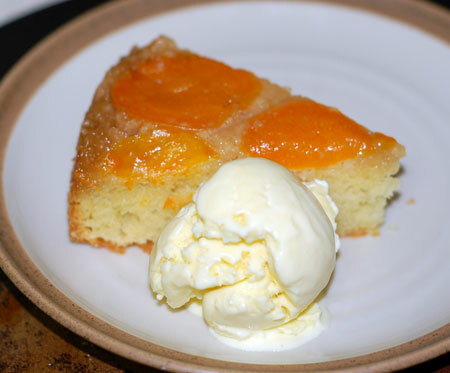 Jeremy requested olive oil ice cream as the next venture for our machine, and since David Lebovitz’s recipe for it suggests roasted apricots as an ideal accompaniment, I decided to serve it alongside the cake. I used a fruity Greek olive oil for the ice cream, and it was a very strong flavor to my taste, enough that I didn’t care for it at all. Fortunately, Jeremy thought it was great, and had no problem taking care of the quart himself. He didn’t think the ice cream worked with the apricot cake, but it was impressive to describe nevertheless: Apricot-Almond Upside Down Cake with Olive Oil Ice Cream. That’s a mouthful! I’m sorry to hear you didn’t like the apricots – the cake looks divine! Thanks, Patricia! It’s a rare dessert that I can’t finish eating, but at least now I can say I tried the apricots.